And when the sun goes down, you can relax in a stylish, low-maintenance new home where all you need is all on one level. Choose from home designs from Brookfield Residential–at a price you’ll love. Five tee options let you experience a new round each time you play. This gorgeous course is always kept in excellent shape and is a past winner of Golf Digest’s Best in the State Award. Send me more information about Heritage Shores! At Heritage Shores, you’ll never have to look far for something fun to do. 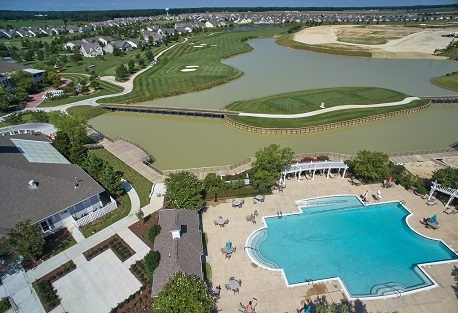 The 28,000-square foot clubhouse is the heart of the community. You’ll quickly discover a built-in social network and a very active lifestyle. There are dozens of clubs, classes and activities for a wide variety of interests. The full-time Lifestyle Director will help keep your calendar full and help you find new opportunities to make the most of every day at Heritage Shores. Residents enjoy gathering in a variety of regular clubs, including Sports & Fitness Clubs (Golf, Bocce, Water Volleyball, etc. ), Hobby Clubs (Gardening, Quilting, Woodworking, etc. ), Social Clubs (Singles, Travel, Bible Study, etc.) and Cards, Dice & Billiards Clubs (Bridge, Bunco, Texas Hold ’Em, etc.). You’ll find a group of neighbors who share a passion for your favorite pastimes. And you’ll find countless opportunities to expand your horizons and try wonderful new things. Send me more information about Heritage Shores! 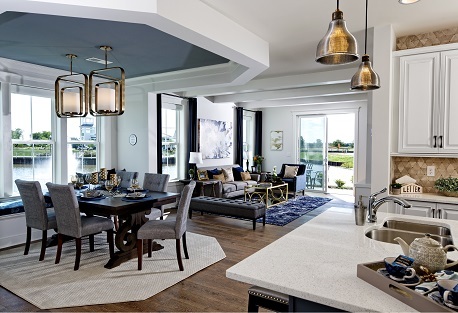 Heritage Shores is made for people with exceptional tastes. Restaurants, shops and markets provide delicious options. And the friendly and talented staff is ready to turn any meal into a memory. Passwaters Restaurant offers casual elegance blending traditional American cuisine with culinary flavors from around the world. Ask for a table on the veranda with views of the 18th green. The 1730 Tavern is the 19th hole. Dine here on your favorites from the Passwaters menu or order up a drink and catch the ballgame on one of the many TVs. 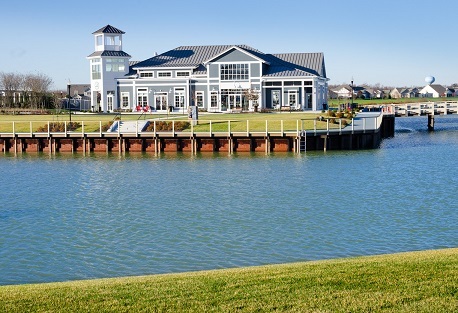 At The Sugar Beet Market, you can have a drink, have a bite or just sit back and enjoy live music and gorgeous waterside, golf course views. It’s a daily destination for residents because there’s a bit of everything here. Send me more information about Heritage Shores! Send me more information about Heritage Shores! Located less than two hours from Washington, D.C., Baltimore and Philadelphia, and less than an hour from the Delmarva beaches, Heritage Shores enjoys an ideal location. Bridgeville is a pleasant agricultural-oriented community known for fine homes and tree-lined streets, not to mention apples, scrapple, cornfields and championship golf. Send me more information about Heritage Shores! The package includes two nights in an on-site, two-bedroom residence, two lunches and two dinners per person. You’ll also receive use of a golf cart for exploring, free round of golf for two. Access to the clubhouse, pools, fitness centers is also included. Plus, you’ll receive an informative sales presentation. You’re also invited to join classes in aerobics, Zumba, jazz, tap and more. Total price is just $229 for two guests age 55 and up. Send me more information about this Heritage Shores Discovery Package!